Heavy Planet presents... TOMB STONE! Tombstone was founded in Paris in late MMXI by Alex, Johan and Clement. Inspired by legends like Black Sabbath or Saint Vitus, they follow this tradition of heavy music and are also influenced by the likes of goatsnake, Electric Wizard, Kyuss, Sleep or even Celtic Frost. 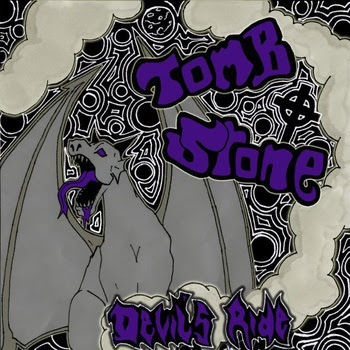 "With loose grooves and a warm fuzzy guitar sensation, Paris band Tomb Stone instantly satisfies your need for Doom. Feel the fuzz rattle your skull as the psychotic vocals waver and moan on Kyuss-inspired opening track "Fake Friend's Blues". The spooky riffs, snail's pace and ripping solos on the monumental Self-titled EP closer "Devil's Ride" will leave you stunned and dazed...DEVILLLL!!! You can download this amazing 4-song EP for free on the band's Bandcamp page."